and that's how we like it. What makes them the same is the way they're wired. They are goal-oriented and growth-focused. We only like fired-up teams. They make financial investments to increase their velocity. They have an itch to create, innovate, and disrupt. They seek partners (not vendors) to help them soar. They work to create value. If being the best isn't important, we're not a fit. The challenge that many businesses face today is based on the dominant organizational structure of the 19th and 20th century; a model that has overstayed its welcome. The top down structure of the corporation worked well when information needed to be squirreled away and protected at the executive level. This model wasn't fast or agile, but times were slow and disruption could be seen a long way out. Today businesses need versatility, alignment, transparency and speed. The new model for our times aggregates the wisdom (the why, the what, and the how) of the organization and makes it accessible to all. In doing so, organizations can increase speed, align the team around common values, beliefs, skills and process, and improve the potential to withstand outside, disruption and change. A model like this can be leveraged to capture massive opportunity. We call this new model, Wisdom Driven . 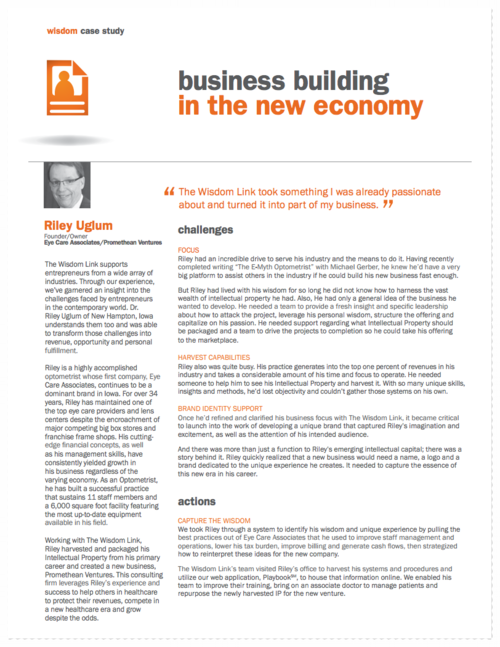 Leading Companies are Driving Performance with The Wisdom Link.